See also: Crittenden Award; Culture Week; Literary Awards. The North Carolina Literary and Historical Association was formed on 23 Oct. 1900 for the purposes of the "collection, preservation, production, and dissemination" of North Carolina literature and history and the "encouragement of public and school libraries; the establishment of an historical museum; the inculcation of a literary spirit among our people; the correction of printed misrepresentations concerning North Carolina; and the engendering of an intelligent, healthy State pride in the rising generations." North Carolina Supreme Court Justice Walter Clark was elected president, and the association's membership included the historical, political, and social elite of the state. Although several historical organizations already existed, none had a statewide focus. Consequently, the new association launched an ambitious program for arousing public support. In its first year, members wrote and shepherded through the General Assembly an act establishing a North Carolina Day in the public schools and another encouraging the establishment of rural libraries. In its second year, it sponsored at Manteo a celebration of the Roanoke voyages of the 1580s, and in its third year, the association created the North Carolina Historical Commission (later the Department of Archives and History). The period was so vibrant that the Historical Commission's first major publication, Literary and Historical Activities in North Carolina, 1900-1905 (1907), contained 623 pages. The North Carolina Historical Commission was so poorly funded that "Lit and Hist," as the association was affectionately called, served as lobbyist and drumbeater for historical and literary interests both in the legislature and among the public. Its annual meetings featured advocates of cultural literacy, including visiting speakers such as Thomas Nelson Page, Edwin Markham, William E. Dodd, Henry Cabot Lodge, Lord James Bryce, and former presidents William Howard Taft and Harry S Truman. From the "mother" association, more specialized organizations gradually emerged, such as the North Carolina Folklore Society (1913) and the North Carolina Federation of Music Clubs (1917). As these younger groups developed, they scheduled their meetings in connection with those of the Historical Association, during a period called "Culture Week." Beginning in 1905, the association presented the Patterson Award to the North Carolina author of a book-fiction, poetry, or nonfiction-judged to be the best published the previous year. President Theodore Roosevelt presented the first award to John Charles McNeill in the Senate Chamber of the State Capitol, but the award was discontinued after 1922 when space ran out on the original cup. In 1930 the Society of Mayflower Descendants in North Carolina presented the Mayflower Society Cup to the Literary and Historical Association. A small replica of the cup, which is silver with an image of the Mayflower standing on a base of Belgian marble, was given annually to the author of an "original nonfiction work of outstanding excellence." 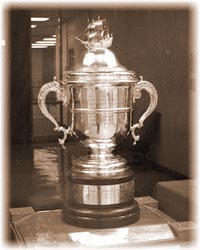 The awarding of the Mayflower Cup ceased in 2002 because of the high expense of the program. Subsequently, affiliated organizations established other literary awards that are presented during the annual meetings of the Literary and Historical Association: the Sir Walter Raleigh Award for fiction by the Historical Book Club of North Carolina, the AAUW Award for juvenile literature by the North Carolina Chapter of the American Association of University Women, the Roanoke-Chowan Award for poetry by the Roanoke-Chowan Writers Group, and the R. D. W. Connor Award for the best article in the North Carolina Historical Review and the Hugh T. Lefler Undergraduate Award, both by the Historical Society of North Carolina. The Literary and Historical Association also created the Christopher Crittenden Memorial Award, given first in 1970, for extraordinary contributions to the promotion of North Carolina history, and the R. Hunt Parker Memorial Award, first given in 1987, for significant contributions to the literature of the state. In the early 2000s the North Carolina Literary and Historical Association continued to serve as the state's central organization dedicated to the promotion of history and literature. Much of North Carolina's progress in both state-supported and private activities can be traced to discussions and recommendations emanating from association meetings and committees. This progress can be seen both in North Carolina's ranking in historical, literary, and cultural activities among other states and in the vibrancy of younger organizations whose founders received their inspiration while participating in the association. William Burlie Brown, "The State Literary and Historical Association: 1900-1950," NCHR 28 (April 1951). North Carolina Literary and Historical Association official website: https://www.ncdcr.gov/about/history/lit-and-hist (Accessed May 16, 2012). North Carolina Office of Archives & History. "Awards." 2010. https://www.ncdcr.gov/about/history/lit-and-hist/awards (Accessed May 16, 2012). Grimes, J. Brian. "Why North Carolina should erect and preserve memorials and mark historic places : address before the North Carolina Literary and Historical Association, Raleigh, N.C., November 4, 1909" Raleigh, N.C. 1909. http://archive.org/details/whynorthcarolina00grim. Hill, Michael. "Mayflower Cup, R.I.P." Carolina Comments 50, no. 6 (November 2002). http://digital.ncdcr.gov/cdm/ref/collection/p249901coll22/id/208033 (accessed March 5, 2013). North Carolina Literary and Historical Association. "The Mayflower Cup." Photograph. Genealogy in Wayne county: I am looking for records from circa 1895 from Wayne county where my Grandfather Carl James McLean was born Feb 23, 1895. I will be passing through this area around Thanksgiving time and would like to access records to find some information about his father Samuel McLean. Are there records available that I can search? The NC Government & Heritage Library and the State Archives of North Carolina have genealogy collections and resources. Unfortunately, we are not able to research your family history for you and so I cannot say if we have records that would specifically locate your ancestors. However, we invite you to visit us while you are in North Carolina. Both agencies are located at 109 E. Jones Street in Raleigh. The Government & Heritage Library is open Monday to Saturday and the State Archives are open Tuesday to Saturday. Please check our websites before you visit to check for hours and closings. Here is the link to the "About" page for the library -- http://statelibrary.ncdcr.gov/about.html. And here is a link to the Genealogy Research page at the library -- http://statelibrary.ncdcr.gov/ghl/resources/genealogy.html. Please also visit this link to the public services page for the State Archives -- http://archives.ncdcr.gov/Public. You'll find information about collections and services for both agencies that will be helpful before you arrive.